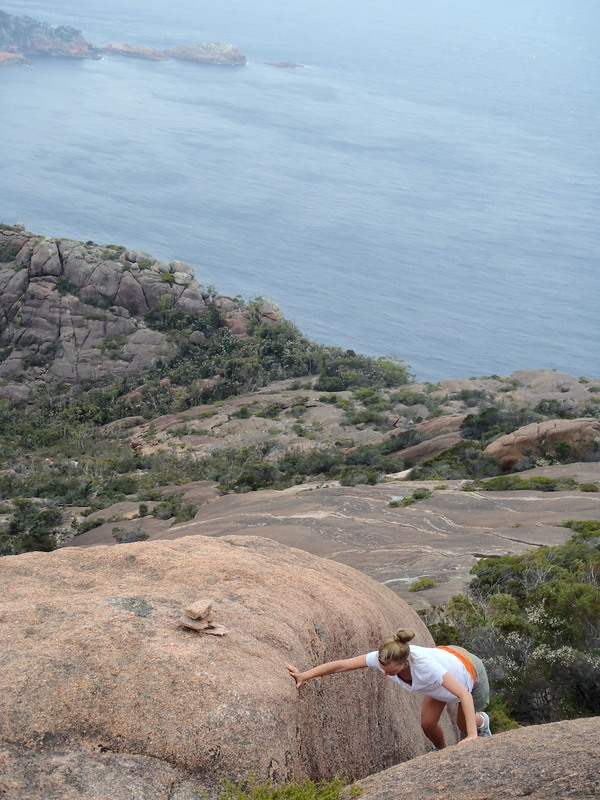 Lost means little when you’re halfway up a rock face, wedged furtively between towers of stone. Every surface looks the same from this angle; no map promises us stable footing. 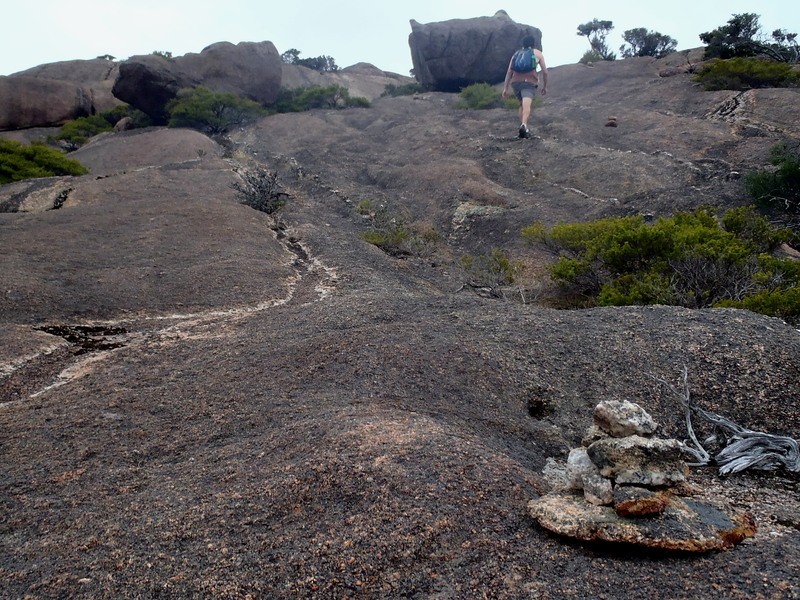 My partner and I are chasing cairns to the top of Mount Parsons. Whether meaningful trail markers or merely lose rubble, these rock soldiers silently mark our ascent. “Up there,” Hadyn points toward five pebbles stacked on the shelf above me. How can you be sure? I wonder for a third time. Who left them here before us, and how do I know we share a destination? Trusting these inanimate guides is either a trick for the faithless, or an assurance to the faithful. But then – as all travel writers do when the next blog post is absent and an angry wind threatens to topple a cairn on your forehead – I realize that this man-made monument is symbolic of a much greater universal truth. 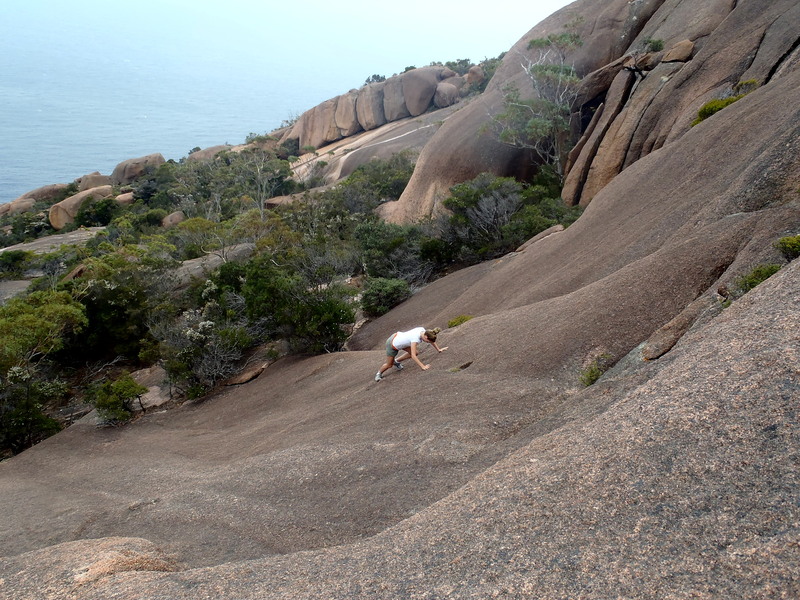 While other peaks in the Hazard Range of Freycinet National Park can be reached on a maintained trail, this one has not been tamed. The only proof of previous human touches are these granite guides. To trust them is to trust everyone who has climbed ahead and kept them in place. Isn’t there something all-inclusive about these wee piles? Throughout the ages, humans have written sagas with nothing more than a few stones, carefully placed one on top of the other: to indicate hunting ground in Greenland, to commemorate grave sites in Portugal, to garner good luck in South Korea. And almost everywhere, they are used to mark trails and point a traveler in the right direction. So I wedge my heel into a narrow crevice, sigh and stretch upward. We can doubt, or we can learn from the signs left by others. After all, it is always better to climb forward than to slide back down. Boy would I LOVE THAT!! Mane when I get back to NL!